Vinod Prasanna is a Master of Indian Classical Music and has studied music from the age of 7 year in Varanasi. Music has been in Vinod’s family for over 250 years. Vinod has found a powerful frequeny. 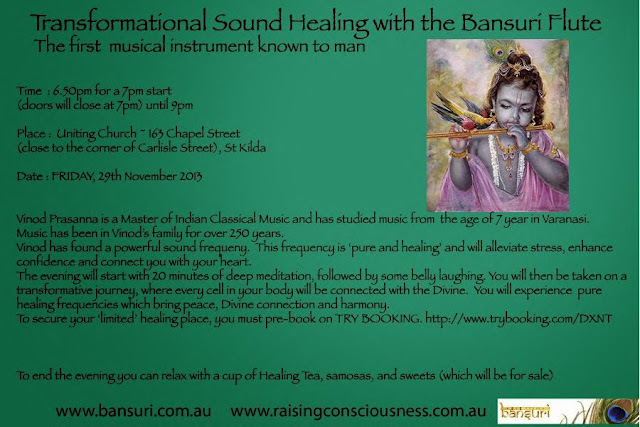 This frequency is ‘pure and healing’ and will alleviate stress, enhance confidence and connect you with your heart.The evening will start with 20 minutes of deep meditation, followed by some belly laughing. You will then be taken on a transformative journey, where every cell in your body will be connected with the Divine. You will experience pure healing frequencies which bring peace, Divine connection and harmony. To secure your ‘limited’ healing place, pre-book on TRY BOOKING. Tickets $35 full / $30 concession.